Evo & Grace: The WanderLusts: Celebrate Christmas with Carol in Theater. Christmas in the Philippines has many reasons and colors, a longest festivity as well, but this coming yuletide seasons, a new but old tradition is about to start once again in Philippine theater, this is through with 9 Works Theatrical along with Globe Live in presenting the award winning and long running acclaimed show “A Christmas Carol” of beloved Charles Dickens classic. 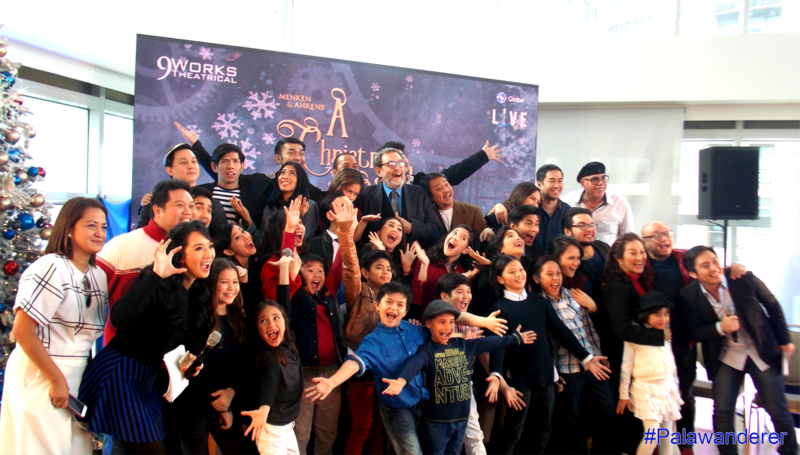 Director Robbie Guevara long wanted to direct the said play especially with 9 Works, and with partnership with Globe they are aiming to do it every Christmas and make it a tradition for theater goers in Manila. “Even though it set in London, England in mid-19th Century, the story is very universal, there will always be Scrooge in every country, and there will always a family that will represent what the purity and innocent of Christmas time means for them, regardless of income level.” Guevara said. A Christmas Carol is going to be stage at the Globe Iconic Bonifacio High Street Amphitheater in Taguig City, and as a Christmas presentation 9 Works see to it, it will be a bigger production compare to their past shows, so far it is the most numbered of cast around 30 or more. Guevara said that it is an experiential thing to happen for Christmas Carol, a lot of mini stage is set up from the main Theater down to the audience area, and the snow effect is something to look forward. Since it has a horror theme expect also some surprises. “I think Filipino will be able to relate with the story itself, we don’t need to be haunted to be reminded, we are generally giving and courteous people, we love Christmas despite the traffic, sometimes the prices go higher than normal, it’s one of the most festive season in the country.” Guevara explain. A Christmas Carol: The Musical is the story of Ebenezer Scrooge, and giving life on stage is Miguel Faustman, he already played the said role many times in Repertory productions, but this version is new to him and it is really a challenge for him to give a new twist. Scrooge is a bitter miser who hates Christmas, and in order for him to appreciate Christmas four ghost visited him and show him the true meaning of Christmas. The music for this musical is from the award winning team of Lynn Ahrens and Alan Menken. Other notable cast include Ariel Reonal, Norby David, Franz Imperial, Ela Lisondra, Kyle Francisco, GM Hernandez, Al Gaitmaitan, Nel Gomez, Jun Ofrasio, Dawn Eduave and many many more. Co presentors are Mastercard & Huawei, Fox, Star World & Bonifacio High Street with Makeup Forever as the official makeup partner, Uniquely Pinoy and MVndo.